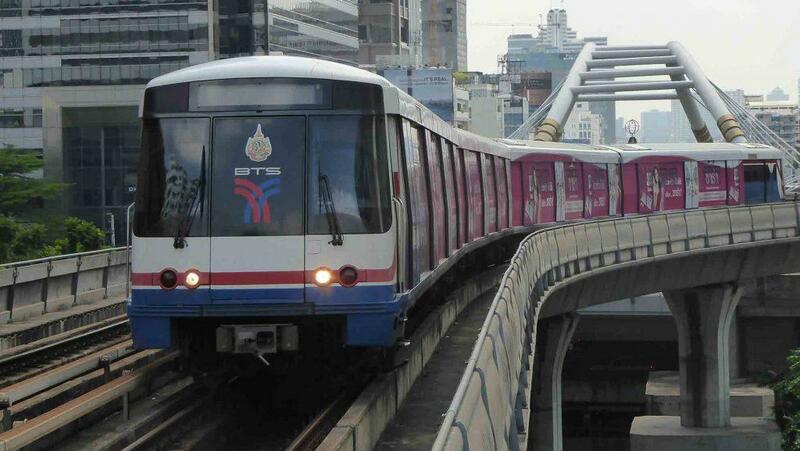 The BTS Skytrain is a fast, clean, safe and efficient way to get around. 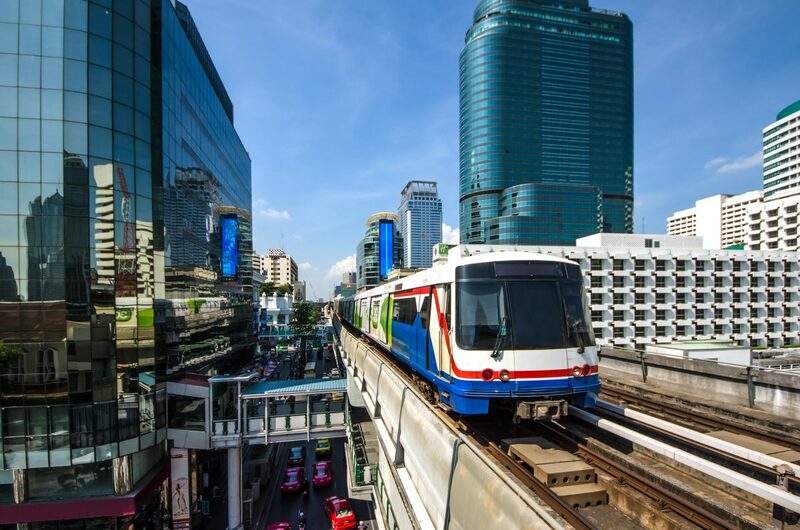 It comprises two lines, the Sukhumvit line that runs between Mo Chit and Kheha, and the Silom line which runs between the National Stadium and Bang Wa. Operating hours are 05.00-24.00, 7 days a week. Frequency is every 3-5 minutes. The trains are air-conditioned and comfortable but can be crowded during morning and evening rush hours Monday to Friday. Fares are inexpensive by international standards. Single journey tickets cost 16-59 baht depending on destination. There are a variety of passes available. The good news is a one-day pass covering the network costs only 140 baht and gives unlimited rides, the bad news is you are only allowed 120 minutes of travel time in the paid area which limits how much you can travel in one day! A stored value pass called a Rabbit Card is also available. It has a 50-baht issuing fee and a 50-baht refundable deposit. 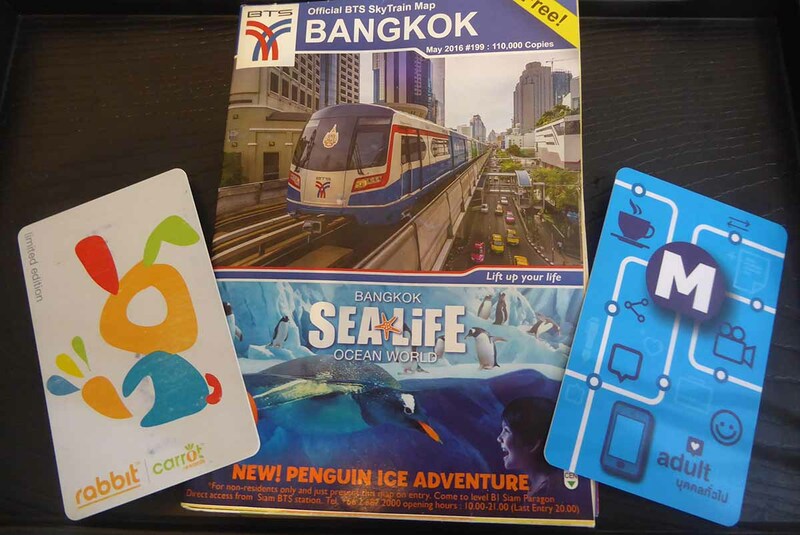 The card gives you a 1 to 2 baht discount on fares. You can add credit to the card or buy up to 30 single journey trips at a discounted rate. 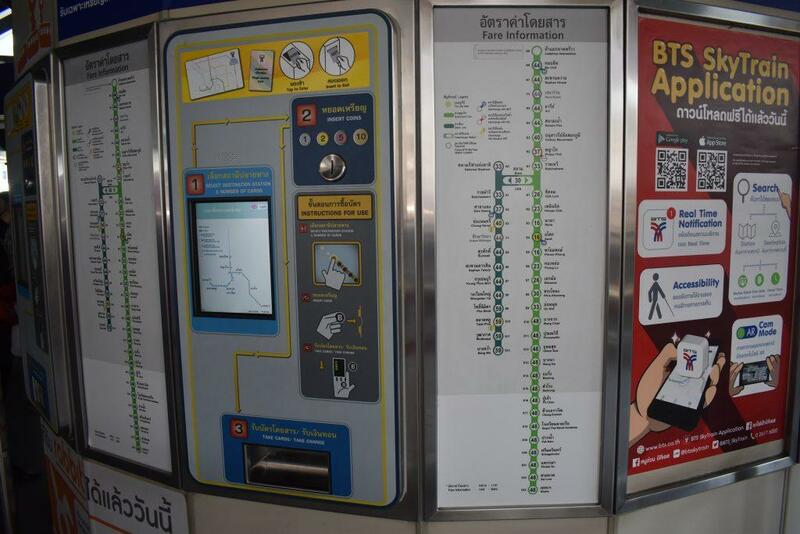 However, the Single Journey pass is only valid between Mo Chit & On Nut on the Sukhumvit Line. and between National Stadium & Wongwian Yai on the Silom Line. There is a surcharge on stations outside these limits. The Single Journey pass is valid for 30 days while stored value credit is valid for 2 years and the card for 5 years. Children under 90cm travel free while those over pay full fare. Ticket offices also sell single tickets, passes, credit top-ups and give change for the ticket machines. 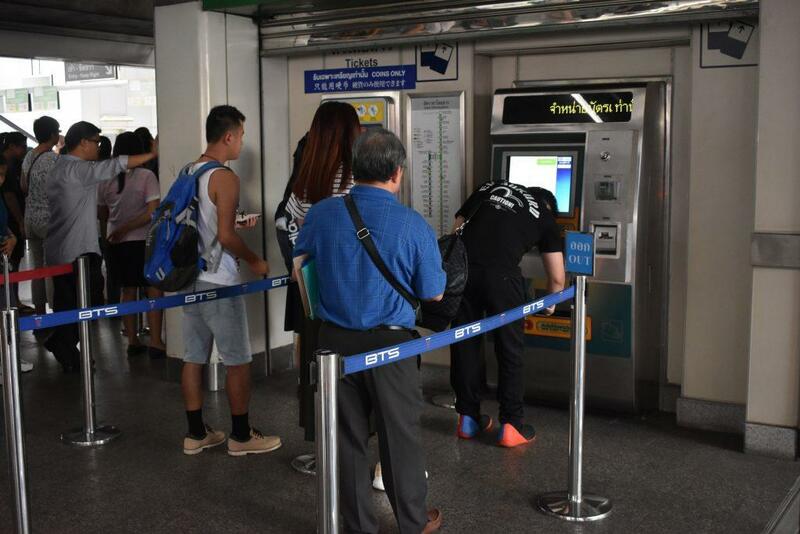 The BTS is now installing automated ticket machines which accept notes & coins, though you won’t find these at all stations yet. If you have a stored value pass you tap in and out of the electronic gates. If you have a single ticket you insert it in the slot and retrieve it as you pass through the gate. Same procedure when exiting though you don’t get the ticket back. When catching, a train, make sure you’re going in the right direction. The platforms have signs with the terminus station names which are Mo chit, Kheha, National Stadium, and Bang Wa. 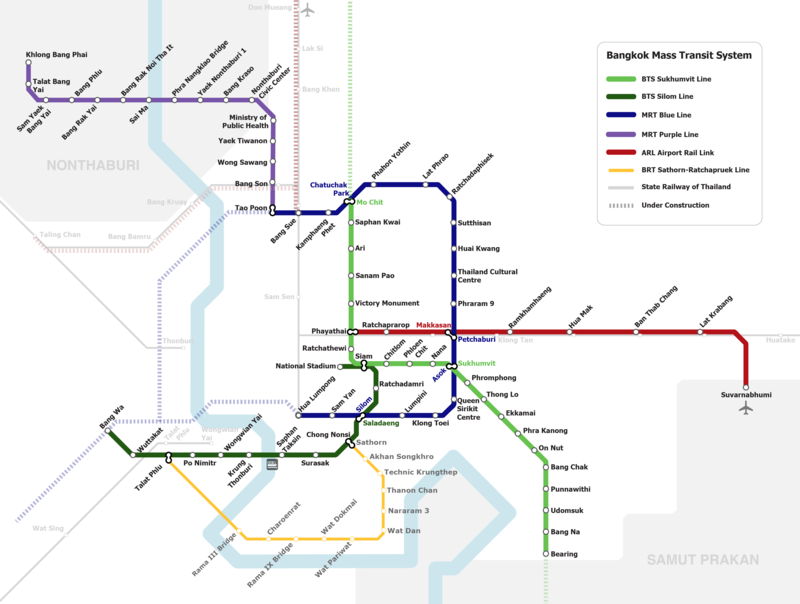 The BTS intersects with the MRT at Mo Chit, Asok, and Sala Daeng, and with the Airport Rail Link at Phaya Thai. Saphan Taksin station connects with the Chao Praya Express and Tourist Boat. All stations have wall maps showing the station exits and the local area. Don’t lose your ticket as you will need it to exit. Check the correct exit for your destination. 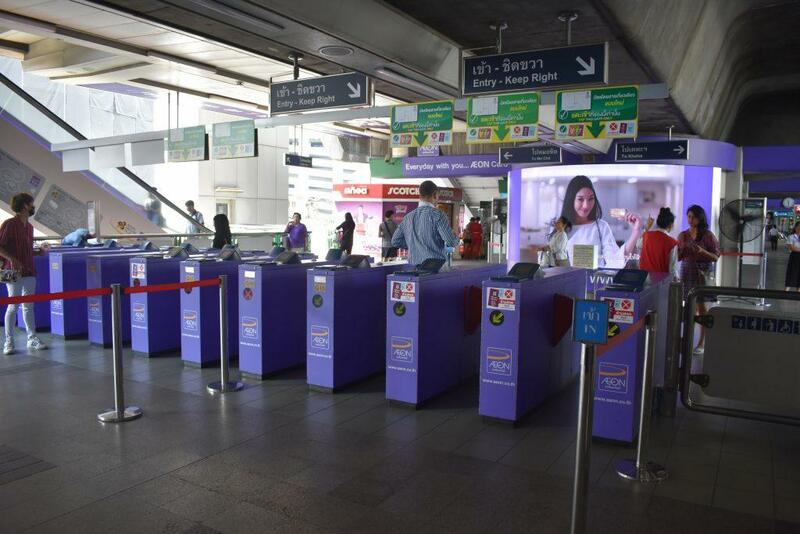 You can pick up a free network map and guide at all BTS station ticket offices. No eating or drinking on the trains or platforms. You may have your bags searched after entering the paid area. 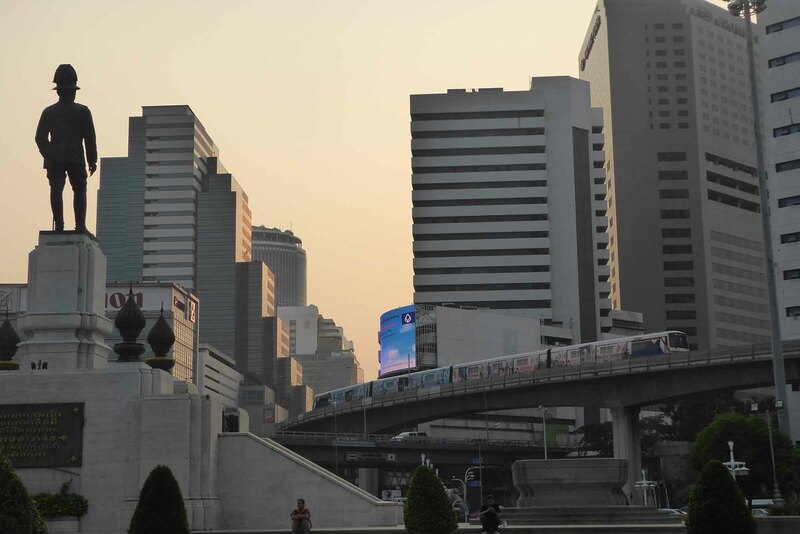 The first trains depart from each end of the Sukhumvit line at 05.15 and at 05.30 on the Silom line. The last train departs Kheha on the Sukhumvit line at Midnight while the last train departing from Mo Chit is 24.12. On the Silom line, the last train departs Bang Wa at Midnight and from National Stadium at 24.24. Allow extra time if interchanging between the two lines at Siam. Please note that the route map has not yet been updated to show the green line extension to Kheha.